A paper-based material consisting of a fluted corrugated sheet and one or two flat linerboards. 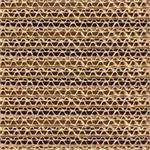 It is widely used in the manufacture of corrugated boxes and shipping. 36 X 48 STOCK SHEET 32 ECT Corrugated Sheets. Minimum order is 25 sheets. Call or Email BIISCO for Quote and lead time.